Next stop: a new vision for the Canadian rail system | Ag Exchange Group Inc. If you’re not in the agriculture industry, you might not think about the Canadian rail system except when it stops you in rush hour traffic. You might not understand what this “rail backlog” really is when you hear about it on the news. You might not understand that the Canadian rail system is a cornerstone to our national economy – but is riddled with problems. If you’re a producer, you know. You know all of this and understand that 12% of the rail cars you see are moving products like yours to market. You need the Canadian rail system because it continues to be the dominant way we move agricultural commodities. Things are changing, but on a small scale and these emerging options will never replace rail in my lifetime. So, we need a bigger vision for the rail industry as part of a complicated national transportation sector. Agricultural commodities need to move to export markets along with other Canadian commodities and goods. No one product can exist in a microcosm. How we move oil and gas, manufactured goods, forestry products, and other commodities all impact how we get our canola, wheat, barley, pulses, etc to port. Private sector is finding opportunities in our supply chain and moving goods differently than they did previously. Technology is starting to connect and inform the transportation industry in ways never seen before. Farmers are finding new ways to sell and move their grain. But it all needs to be pulled together. We need some big changes, from leaders who have the kind of vision we had 100 years ago when the first tracks were laid. Getting grain from the farm to the end user is both interesting and challenging. Most of us think about traditional channels when we think of grain movement. From the farm via truck to the elevator. From the elevator via rail to port. From the port via boat to some mysterious overseas buyer. But not all grain moves this way. There are many other options available for producers to deliver grain through less traditional channels. This is especially appealing for growers who need to move grain this spring and want to avoid the rail backlog. However, even as we welcome more diverse options to sell our grain, a clear majority still moves by traditional channels. And that channel relies on the Canadian rail system. Approximately half of Canada’s exports are moved by rail. Rail also moves about 70% of the intercity surface freight. As we all know, CN and CPR dominate with over 75% of the tracks and 75% of the annual tonnagemoved. Shortline railways are important, and their movement of goods to the mainline railways represent over 20% of the big two’s carload. Every year, the Canadian rail system moves over 330 million tonnes of goods. 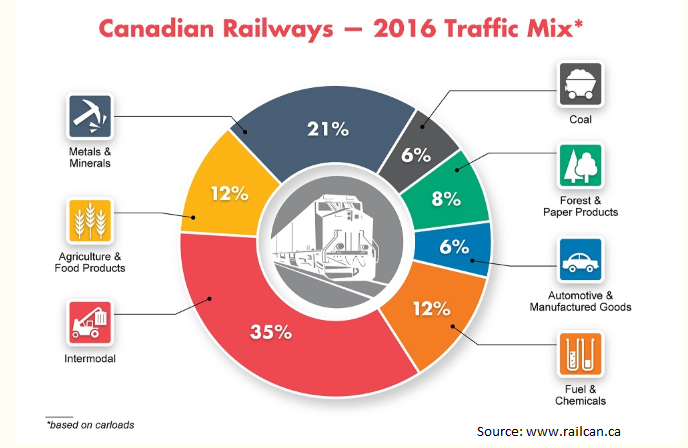 As you can see in the Railway Association of Canada’s graphic, 12% of that total is represented by agriculture and food. In 2016, that was close to 511,000 carloads that were filled with agricultural products. Intermodal traffic (the movement of shipping containers and truck trailers) gets the biggest piece of the pie and continues to grow according to RAC. To paint the industry with a very broad brush, we have two major end users: continental (Canada and the US) and international or overseas. We primarily reach these markets using the traditional – rail reliant transportation system. Well, let’s face it. What other options do we have today? We produce most of our grain in a part of Canada without immediate access to a waterway. And some calculate trucking bulk agricultural commodities for export at around 5 times more expensive. Moving north is challenged by a short shipping season and an out of use rail line. Getting goods to Churchill is difficult. South is an option. However, you’re competing with US crops, and you’ll only get so far before you get into competition that runs the rates up. Currently, I am not aware of any Canadian companies who have mastered US routes to the Mississippi and onto New Orleans to load vessels. We move grain east to access the Great Lakes. The biggest problem is big Panamax ships cannot be loaded to ocean levels in Thunder Bay. The lakes and locks do not allow for that depth. We rely on lake vessels to move grain from Thunder Bay to deep water terminals up the St Lawrence where vessels can be loaded to ocean levels. Trucking directly to the seaway is inefficient and some terminal only have water access. That also means they don’t have rail access. As beautiful as those mountains to the west are, they pose a huge challenge to our country. Efficient routes to move goods through them are limited and two companies dominating the rail passes. So even with more rail competition, the bottleneck lies with how many places you can get through the mountains. And there’s no denying, trucking grain through the Rockies is wildly inefficient. Have you ever stopped to think that our movement west counts on a channel that was built over 100 years ago! Sure, there have been improvements in engine power, train length, and car capacity. But the heart of the Canadian rail system counts on paths laid down over 100 years ago to create something that would be impossible in today’s dollars. It was possible then because it was built in a different time, with different labour and safety standards. So, where am I going with this? I want you to stop and think. We look at our grain supply chain challenges as a microcosm. But it’s not. It is part of something bigger. Much bigger. And it needs the vision that our forefathers had when they built a railway to unite a country. For the most part, the cars we see on a train are tankers, containers, and dry bulk commodity cars. Tankers can go out full and theoretically could come back full, but oil and gas are an export, so they generally come back empty. Dry bulk commodity cars (grain or fertilizer) go out full and come back empty. Containers come in full and very few go out full. That kind of looks like an opportunity! All those cars fight for space to go back and forth though. So that is why I say we need vision to address what is essentially a Canadian economic problem. I am not a supply chain expert, but to me it’s obvious that we need to move all goods as efficiently as possible. However, if each commodity is looked at individually there will be no resolution. Two immediate things that come to mind are pipelines and better use of containers. Building pipelines is good for the economy and in the long run relieves pressure on other supply chain modes. We know that pneumatically moving grain to coast would not be plausible. But it could replace some of the tanker cars that move fuel and make up some of the 12% of carload today. Figuring out how to fill containers and send them back full would also relieve some of the pressure and eliminate the inefficient practice of shipping units empty. I do not write this to cause controversy. However, all commodities do not compete for movement on a supply and demand pricing model. It is not a free market system. Where revenue caps exist, there is no real reason for the rails to provide more service to agricultural commodities other than emotion and a perception of fairness. The scenario isn’t great for our industry. Rail lines feel pressure from shareholders and rising costs. So, if other goods moving by rail are working on a free market, it makes it tough for ag commodities to make headway. Collaborative working relationships are tough. The system is set up to fail and existing legislation really is a bandage for a much larger problem. There is a glimmer of light in all this doom and gloom. Since 2012 more global companies are looking to source commodities from Canada. Some of those companies have learned from other places on this beautiful planet that containers are an effective way to move bulk commodities. These companies also realize that processing near the source and then using containers to move goods to market is an efficient use of the supply chain. Canadian companies figured this out too. There is more local processing happening than ever before. You need not look any further than companies like Roquette, Scoular, AGT Foods, Verdient Foods (and many others) who have expanded their foot print in Canada. That is a great sign of confidence in Western Canadian ag. There’s a lot going on in the world of global transportation. Big data, analytics, and technology will all lead to better utilization and efficiencies – and might improve how our industry uses containers. The data and technology will help the industry better manage the peaks and valleys of transport. It’s also possibly part of the solution for better collaboration between rail, other forms of transport, and the companies moving goods. Also consider that there are technology pressures around sustainability and technical advances in autonomous vehicles that can change the transportation landscape in the years and decades to come. However, even with every advancement in the industry, the Canadian rail system still needs a greater vision. We need a vision comparable to those who saw our country united by rail. A holistic view of Canada is needed before leaders can articulate a plan to get Canadian goods to international markets more effectively. Until then we will continue with band aid fixes on symptoms and hope more private sector leaders will have the vision to find their way.